AJ “Bazooka” Banal was defeated by Pungluang Sor Singyu via a technical knock-out in round 9, losing a chance to grab the vacant WBO bantamweight title at Pinoy Pride 17 held Saturday night. 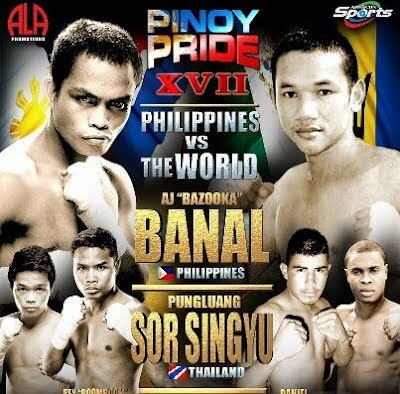 Banal became the 28th knockout victim of Sor Singyu since the 24-year-old Thai boxer started his professional career eight years ago. Sor Singyu’s boxing record improved to 43 wins (28 by KO), 1 loss, and no draws and contests, in 44 fights. The 23-year-old Banal has 28 wins (20 by KO), 2 losses, and 1 draw in 31 fights. Results of the rest of the matches on Pinoy Pride XVII: “Philippines vs The World,” however, were favorable to other Filipino boxers. Rey “Boom Boom” Bautista won over Daniel Ruiz of Mexico via a split decision. The victory gave Bautista the WBO international featherweight title. Meanwhile, Jason “El Niño” Pagara successfully defended his WBO international junior welterweight title. He knocked his opponent Barbados’ Miguel Antoine out in the first round. Other results: Michael Domingo defeated African fighter Mudde Ntambe Rabison via a second round knockout; Marlon Tapales likewise knocked out Indonesian Rasmanudin at 1:10 in the second round; Juan Martin Elorde came victorious against Gerry Sismundo via a fourth round TKO; and Randy Bullong defeated Japan’s Kazuma Ejiri via stoppage in the final round of their bout. The video of the October 20 Pinoy Pride 17 matches will be aired Sunday morning on ABS-CBN.